You can use your Suunto Traverse Alpha as an alarm clock. Turn the alarm on/off and set the alarm time in the options menu under GENERAL » Time/date » Alarm. 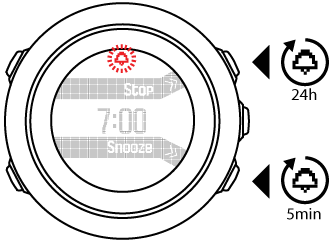 Your Suunto Traverse Alpha time can be updated through your mobile phone, computer (Moveslink) or GPS time. If you have paired your watch with the Suunto Movescount App, time and time zone are automatically synced with your mobile phone. GPS time corrects the offset between your Suunto Traverse Alpha and the GPS time. GPS time checks and corrects the time whenever a GPS fix is found (for example when recording an activity, or saving a POI).